By The Shore Stamping with Jen Pitta: Save the Date! Can you believe it? Twice in one week? I'm seriously going to try and be better about the old blog. It was always my way to connect with you and for some reason it became too difficult. It was funny at OnStage last week, I was talking with a lot of my demonstrator friends and I was amazed how many of them knew my blog... really? You mean the one that hasn't been updated in six months?? Time to fix that! Anywho... I did an initial run through my craft room this morning to find all the retiring items in my stash -- holy moly! Look at that picture -- that is a lot of goods up for grabs! As always, I'll be hosting my annual Customer Appreciation/Retired Merchandise BOGO sale this summer to celebrate the launch of the new catalog (have I mentioned that it is amazing?). I'd love to have you join me... so save the date! Saturday, June 4 and possibly either Friday, June 3 or Sunday, June 5th as well. I know that weekend is likely to be graduation weekend for some folks so I'll try and give a couple of options for you to stop by. Not familiar with my annual event? Basically, I set up my whole house as a store -- anything you buy in the retired "store," you'll get equal dollars to spend in the brand spanky new catalog for FREE (you just pay tax and shipping on the new). So all of this goodness in the picture above (plus more!) will be part of the retired store. There's also games, prizes and treats, too! It's one of my most popular events of the year and that's why I wanted to give you a heads up. More details will come as we get a bit closer so be sure to sign up for my weekly newsletter if you haven't already. Speaking of "heads up," I mentioned it in my last post, but the retiring list is now up -- that means it's your last chance to get some of the fabulous crafting products that are retiring from the current catalog. You can download the list as a PDF here or shop straight from the online store here. But hurry, lots of items are at a discount and some are already sold out! This is a simple collage card using By the Tide. I did a version of this card previously (not sure if I ever shared it on the blog), but I just reinvented it using different colors. 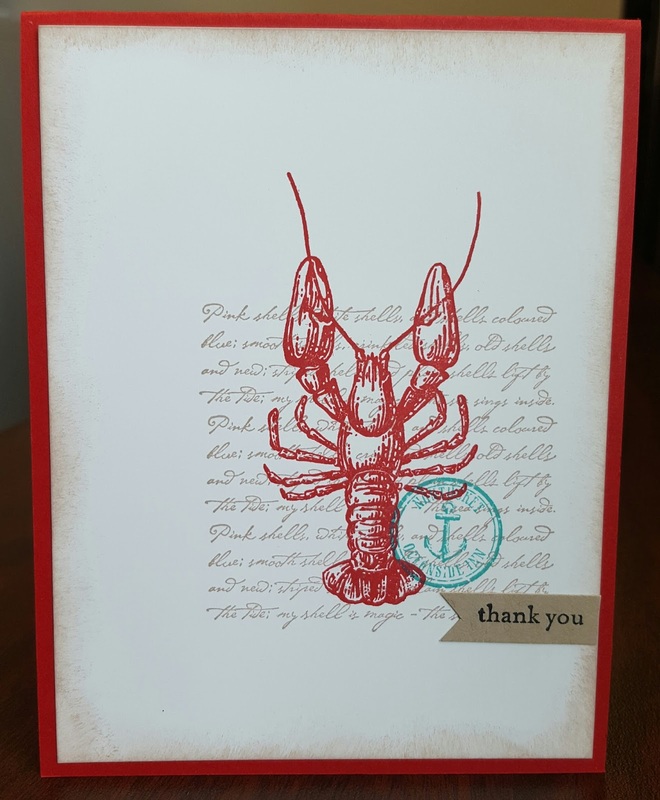 This is a great card to mass produce: just two pieces of cardstock (Real Red card base measures 11" x 4.25", so it folds at the top, and one piece of whisper white measuring 4"x 5.25"), three ink colors (Real Red, Crumb Cake and Bermuda Bay) and a little inking with Crumb Cake ink around the edges of the white (and a small piece of Crumb Cake cardstock with Basic Black ink for the sentiment -- you could stamp directly on the card, though, too!). Super simple stamping. That's what we all love right? 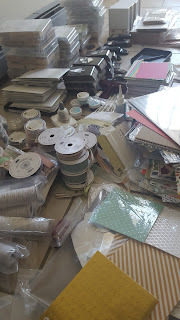 Okay... lots to do today... card class is on Tuesday, my Shore Stampers group meeting is on Thursday and the Cape Cod Mini Maker Faire is on Saturday (This is a super fun, interactive vendor event. It's being held Saturday, April 30 from 10am - to 4 p.m. at the Mashpee Middle-High School - yup, that's really it's name... I checked! You should come visit!) 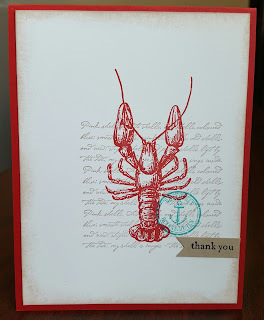 And if you'd like to stamp this week, you should check out my card class or my Shore Stampers Community (click on the Become a Shore Stamper tab above). Till next time... happy stampin'!